[Diocese of West Tennessee] The Episcopal Diocese of West Tennessee elected the Rev. Phoebe Roaf, rector of St. Philip’s Episcopal Church, Richmond, Virginia, as its fourth bishop on Nov. 17. Roaf will be in stalled in a consecration service May 4 at Hope Presbyterian Church. The Most Rev. Michael B. Curry, presiding bishop of the Episcopal Church, will preside. Roaf is a lifelong Episcopalian. She grew up in Pine Bluff, Arkansas. 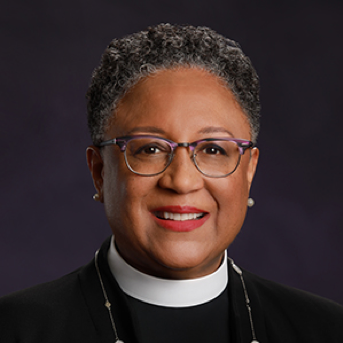 She is rector at St. Philip’s, the oldest African-American church in the Episcopal Diocese of Virginia, where she has served as the parish leader since 2011. Before St. Philips’s, Roaf was associate rector for three years at Trinity Episcopal Church in New Orleans. Roaf, who earned a law degree from the University of Arkansas, Little Rock, and clerked two years for Judge James L. Dennis, U.S. Court of Appeals for the Fifth Circuit, worked in commercial real estate before pursuing a call to serve the Episcopal Church as clergy. She completed her bachelor’s degree at Harvard University and MPA at Princeton University. She attended Virginia Theological Seminary in Alexandria. She is vice chair of the board of trustees at Virginia Theological Seminary. The other nominees for the position were the Rev. Marian Dulaney Fortner, rector, Trinity Episcopal Church in Hattiesburg, Mississippi; and the Rev. Sarah Hollar, rector, St. Mark’s Episcopal Church, Huntersville, North Carolina. “The mission of the church is to promote reconciliation among people and with God. Phoebe Roaf has the creativity and vision to help the Diocese of West Tennessee set a bold vision for the work of Christ in this region at this time, and the ideal skillset to help us achieve it,” said the Rev. Sandy Webb, rector of the Church of the Holy Communion and chairman of the committee overseeing the bishop transition process. Roaf was chosen in a balloting process in the diocese’s annual convention at St. George’s Episcopal Church in Germantown. All clergy and elected lay delegates are allowed to vote. Under the canons of the denomination, bishops are chosen by a clergy and lay leader votes. They must receive a majority from each group on the same ballot in order to be elected. Roaf succeeds Bishop Don E. Johnson, who has served the Diocese of West Tennessee as bishop since 2001. The diocese, which covers all of Tennessee west of the Tennessee River, has 8,260 active members and an average Sunday attendance of more than 3,000. The diocese announced the three nominees in late summer. They visited in late October, meeting with parishioners and clergy in Memphis and Dyersburg and responding to questions in a public forum. In her application materials, Roaf referenced the divisions in the society and the role of the church. For more information on Roaf, including her resume, photo and video reflection, go to wtnbishop.com/bishop-elect.